Mission police navigate through flooded streets in town. Update: City of McAllen to issue sand bags until 6 p.m. The City of McAllen will issue four sand bags per McAllen household at the city of McAllen Recycling Center, located at 4101 N. Bentsen Rd., for all residents who can safely drive to the facility. The facility will close at 6 p.m. Residents must show proof of residency with a valid ID or a current utility bill. Residents will be limited to four sand bags each. 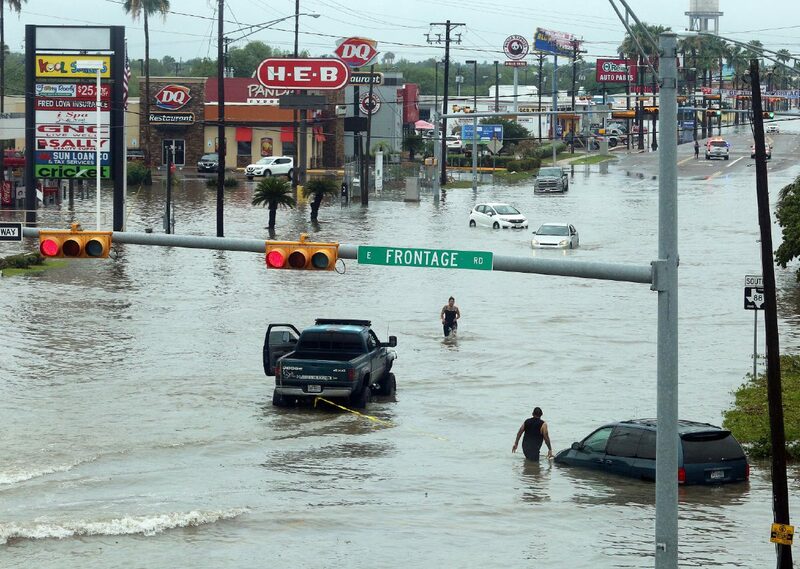 Stalled vehicles are towed in high water on Texas Blvd. after heavy rains caused water to rise and flood whole neighborhoods on Wednesday, June 20, 2018, in Weslaco. Metro McAllen has resumed service. However, Route 1 will not go south beyond Jordan Avenue. Governor Greg Abbott issued a State Disaster Declaration on Thursday for six Texas counties impacted by severe weather and flooding. Counties included in the disaster declaration are: Aransas, Cameron, Hidalgo, Nueces, San Patricio and Willacy. “As severe weather and flooding continue to impact parts of Texas, our first priority is to ensure the safety of our fellow Texans in harm’s way,” Abbott said in a news release. “The State of Texas has activated all necessary resources to help respond to the ongoing severe weather, and we will continue to provide any assistance to local communities. I thank our first responders who are working to keep Texans safe, and I encourage all those in the affected regions to continue to heed all warnings from local officials. Hidalgo County urges all residents who need evacuation to accept it from its emergency responders. To report flooding and health issues and for information on shelters, call the county hotline at (956) 292-7750. Metro McAllen services have been suspend until further notice, the city announced in a news release. Metro Connect Greenline, which runs to Edinburg and the University of Texas Rio Grande Valley, is also suspended until further notice. Metro Connect to Brownsville is running with delays. 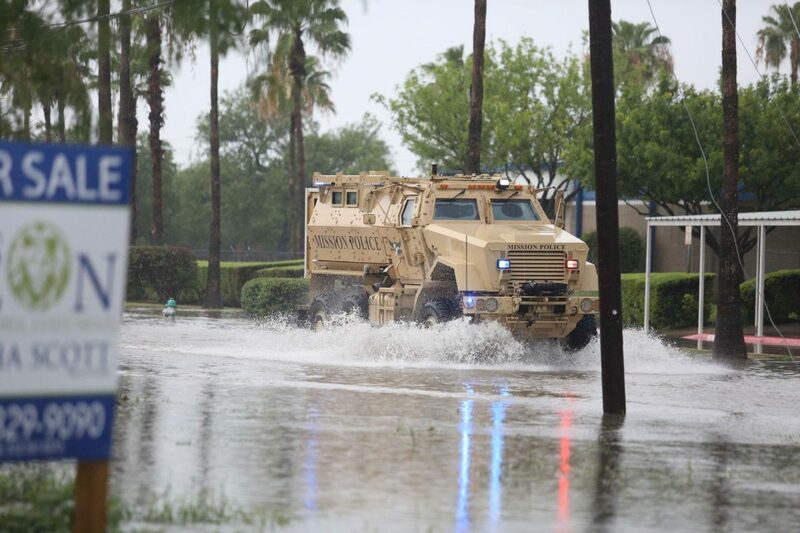 McAllen Mayor Jim Darling declared a local state of emergency, according to a news release. The action is due to heavy rainfall which has caused flooding, closing down many roadways. Residents are urged not to travel unless absolutely necessary. In emergency situations, they should call 911, or call (956) 681-1234 for non-emergency assistance. The city of McAllen will also be issuing sandbags for McAllen residents at the McAllen Recycling Center, located at 4101 N. Bentsen Road, for all residents who can safely drive to the facility. Residents must show proof of residency, including a valid ID or a current utility bill, and will be limited to four sandbags each. Sandbags will be distributed until they last. Alton Recreation Center on Dawn & Highway 107. The University of Texas Rio Grande Valley’s Edinburg campus is inaccessible through its north and south side entrances due to extreme flooding. The university resumed regular business hours today but alerted students to notify professors if they are unable to make it to class due to the weather conditions. Highway 83 is partly closed from FM 649 to FM 3167, between Roma and Rio Grande City, due to flooding from El Quiote Creek, the Starr County Sheriff’s office confirmed. The Roma Police Department announced via Facebook the closure of Raucon St. from Garfield Ave. to Morelos Ave. and Bravo Blvd by Raucon. A flash flood warning for McAllen, Mission and Edinburg has been extended until 1:45 p.m. The Hidalgo County Courthouse and Annex III building are closed for the rest of the day due to flooding in the area and maintenance issues. All Precinct 1 offices in Weslaco remain closed today with Commissioner David L. Fuentes and a skeleton crew working out of the city of Weslaco. Tax Offices and Elections Department are also closed. Precinct 2 offices, including the JP and Constable’s offices are open today. Residents in need shelter or assistance should call the Hidalgo County hotline at (956) 292-7750. The National Weather Service in Brownsville has issued a flash flood emergency for south-central Hidalgo County. The NWS is warning people to stay away from the area as flash flooding is occurring and is expected to continue throughout the morning. The National Weather Service in Brownsville has issued a flash flood warning until 11 a.m. for Mission, Edinburg and McAllen. The city of Weslaco is distributing sand bags on the south side of city hall located at 255 S. Kansas. The sand bags are only for residents and businesses of Weslaco. Proper identification will be required. 6 per household 12 per business. Metro McAllen and Metro Connect have suspend services and will attempt to resume services at 11 a.m., according to an email from the city of McAllen. For more information, call (956) 681-3510. Hidalgo County Precinct 3 offices in Mission, including the Justice of the Peace courts, WIC and Tax Office Precinct 3 Sub-Station are closed today due to flooding in the area. Commissioner Joe Flores’ office is staffed with a skeleton crew to answer calls and monitor the weather. Residents in need of shelter or assistance should call the Hidalgo County hotline at (956) 292-7750. All South Texas College campuses will be closed Thursday due to inclement weather. In an email, STC said it will continue to monitor weather conditions and will provide any additional updates as they become available. The National Weather Service in Brownsville has issued a Flash Flood Emergency for Mission, McAllen and Alton and are advising residents to stay home. The city of Mission has opened a shelter at its parks and rec department located at 721 N. Bryan Rd. Emergency personal in the area are receiving hundreds of calls from residents asking to be rescued, the city tweeted Thursday morning. Mission CISD has canceled summer school and camps for Thursday because of the weather. Students already at school will be be supervised until transportation arrives for them. Arrangements for transportation for students who ride the bus will be made once conditions improve. District staff should report to work as conditions permit. Sharyland ISD summer school classes have been cancelled for Thursday because inclement weather. There is a delayed start of 9:30 for the staff.